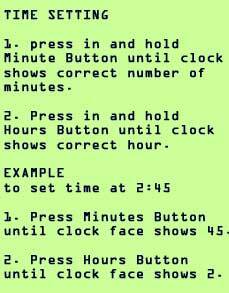 How can you resist an alarm clock that gives you specific instructions on how to set it, complete with examples? The sad truth is, you know you can't resist! You love it too! Feel yourself giving into the Love of the Alarm Clock! and shiny chrome-like detailing! Feast your eyes upon the lovely simulated-wood slats! I just embezzled this beautiful Texas Instruments "Certified Electronic Clock" (it has a certification saying that it truly is an electric clock) from work. it was in a box filled with ancient, rotting computer parts left over from the dawn of time. Actually, they were just a bunch of printer cables and old ergonomic devices dating back to the mid-90s; this beautiful specimen of chronology was the only interesting thing in the box. You're probably asking yourself, "why the heck is she devoting an entire web page to an antiquated piece of junk she stole from work? The answer, my friend, is simple. Because I love my clock! There are far too few web sites out there devoted to the worship of clocks of this nature. 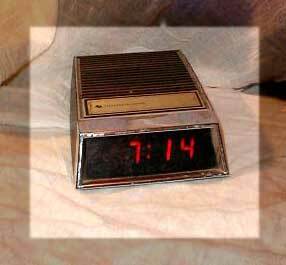 This clock is remarkable, because it doesn't actually have an alarm--it's a purely decorative faux-woodgrained piece. So me even saying it's an "alarm clock" is misleading! That's the problem with Cyberspace these days. You can find out anything you want to about the Backstreet Boys, or which hairdo you should have, or even join a cult...BUT, until now, you couldn't easily sit back and silently meditate on how cool my clock is. Now you can. Enjoy.